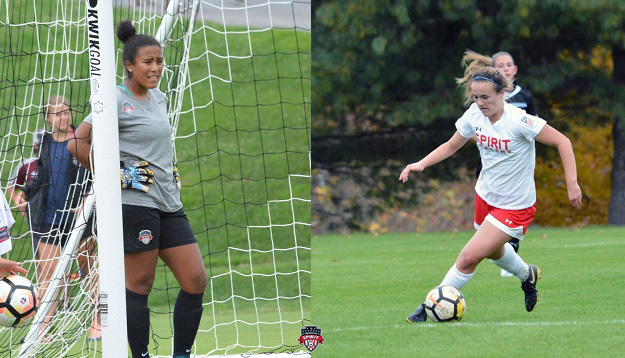 Boyds, MD (February 3, 2018) – Washington Spirit – Baltimore Armour forward Jordan Canniff and goalkeeper Cayla White have been named to the U.S. U-17 Women’s National Team roster for a training camp and three friendly matches in the Copa Provincia de Buenos Aires tournament in Argentina. The USA will face Chile (Feb. 13), 2017 FIFA U-17 Women’s World Cup host Uruguay (Feb. 15) and Argentina (Feb. 17) as the young Americans continue preparations for the 2018 CONCACAF Women’s U-17 Championship in April. Canniff is one of 16 Girls’ Development Academy players named to head coach Mark Carr’s 22-player roster for the trip. She is one of 11 players on the roster with at least 10 career caps for the U.S. U-17 Women’s National Team. Her 20 caps at the U-17 level are the third-most on the squad, behind only defenders Kate Wiesner (25) and Kennedy Wesley (23), who both played alongside Canniff in the 2016 FIFA U-17 Women’s World Cup. Canniff leads the team in international goals with nine while Maya Doms, Croix Bethune and Sunshine Fontes have six each. White has anchored the Spirit – Armour U-18/19 defense this season, making 8 starts in net. This is her third call-up to the U.S. U-17 WNT since May 2017. She particpated in the team’s Florida camp last spring, then received another call-up for their joint training camp in California alongside the U.S. U-18 National Team during the fall. She is one of just three goalkeepers on Carr’s latest roster, as the U-17’s prepare for the CONCACAF Championship. The USA will participate in the 2018 CONCACAF Women’s Under-17 Championship being held in Nicaragua from April 19-29. The Americans, seeded atop Group B as reigning regional champs, will face Costa Rica, Bermuda and Canada in the tournament that will qualify three teams to the 2018 FIFA U-17 Women’s World Cup.